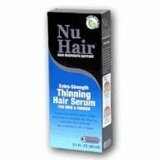 Nu Hair Review of Nu Hair Thinning Hair Serum. For those of us who have thinning hair and would like to do something about it. This is a hair nutrient that will energize your scalp, and works for both men and women. It has powerful nutrients which are time released directly onto your scalp thickening your hair naturally and strengthening your hair by energizing your scalp. This is an extra strength topical formula. Saw Palmetto: Counteracts the unhealthy effects of DHT on hair. Biotin: B vitamin, used to promote healthier hair. Panthenol: For Strengthening and moisturizing the hair shaft. Tocopherol Acetate: Antioxidant to help protect your hair. Trichopeptide: Promotes cellular balance of scalp. He Shou Wu: This is a Chinese herb traditionally used to promote healthier hair. Jojoba Oil: Adds luster and strength to your hair while moisturizing your hair and scalp.